With admirable clarity, UBC Professor Patrick M. Condon discusses transportation, housing equity, job distribution, economic development, and ecological systems issues and synthesizes his knowledge and research into a simple-tounderstand set of urban design rules that can, if followed, help save the planet. Using the Vancouver Region as his case study, he compares and contrasts the problems and progress of this region with those of other North American urban areas. Of particular new importance is how city form aects the production of planet-warming greenhouse gases. 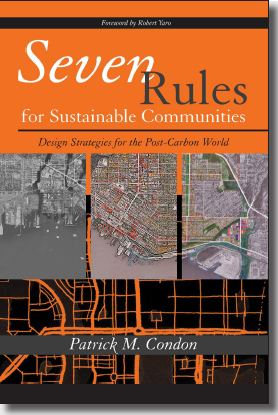 Patrick Condon explains this relationship in an accessible way, and goes on to show how conforming to seven simple rules for community design could literally do a world of good. Each chapter in the book explains one rule in depth, adding a wealth of research to support each claim. 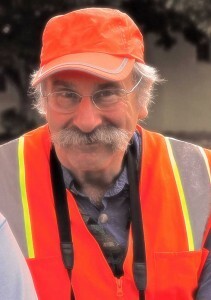 Dan Burden spoke last night summarizing his extensive experience in remaking places for people instead of cars. He used a lot of illustrations which I have not been able to locate on line. He does have a collection of images on flickr using the identity walkablecommunties some of which I have used below as well as one of my own (Bryant Park) and some others I have found on the web. SFU were making a video of the presentation as well, which will be on their web page eventually. He opened by saying that Vancouver is the lead city for bringing about change for what we need. He intended to “validate that you are in the right field”. There is going to be a profound change for North America which for the last sixty years has been designed around the car. His job has been taming the urban highway. This mean dealing with both building form and street form – to make them relate to the human being – and do a better job of moving cars. 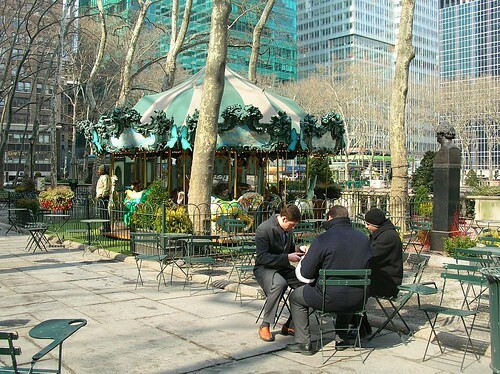 Bryant Park New York City – the only activities here in the 1960s were drug deals. But only little things needed to be tweaked. “We needed to find the right height for the wall around the park so that people could see in”. It has become a social gathering place – we changed the wall and put in over 3,000 chairs which are portable, and only 30 a year get stolen. We are going to measure everything by the foot. All areas are going to transition as we return to health and social equity. There will be bigger and more massive storms (illustrated by the picture of the Fallen tree in Stanley Park) and this will effect every waterfront. 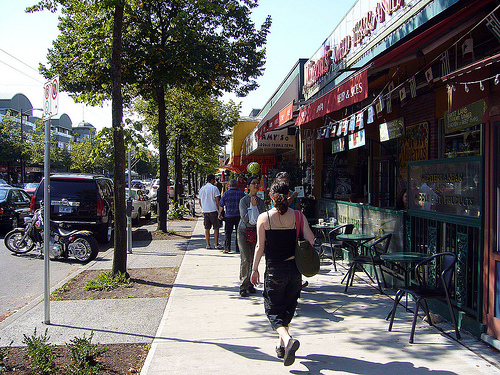 Density does not generate traffic – it generates pedestrians and cyclists. By maximizing sight lines we create public realm. All over America there are places were the streets have been laid and the sewers put in, but no houses will ever be built. This suburban expansion was the wrong concept at the wrong time – all the housing stock in Florida will not be sold in ten years. We now see places like Calgary, Vernon, Edmonton where the spillover of knowledge and technologies in making human places has happened. But it must also be acknowledged that overcoming change in order to not have the worst possible change takes courage “Just ask Fred Bass” – Burrard Bridge. In Seattle they are taking out the McDonalds and Burger Kings and putting in coffee houses as part of mixed use developments. There is a serious problem with SOVs. The traffic system will always break down. Car buyers are very fickle. Just two years ago fuel efficiency was 17th on list of what people look for in a new car. A long way behind cup holders. That changed, but gas prices have not come down as far as they were, and will not again. West Lafayette Indiana – in showing how the narrowing of streets worked he remarked, “It’s the intersection that mediates traffic” not the width of the street. Tennessee Ave in Tallahassee – an arterial road 7 lanes wide that kills one pedestrian a year. It will be narrowed to 4 lanes and will move more traffic. Today people are returning to cities for their health. He told the Cherokee 2 wolves story to illustrate how we can no chose which way to go. Using a picture of the inner harbour in Victoria be highlighted several people who were “loitering” – change that to “lingering” and it becomes a good not an evil. For a long time we simply looked at vehicle capacity. We now need to look for other indicators such as the number of weddings on a bicycle. 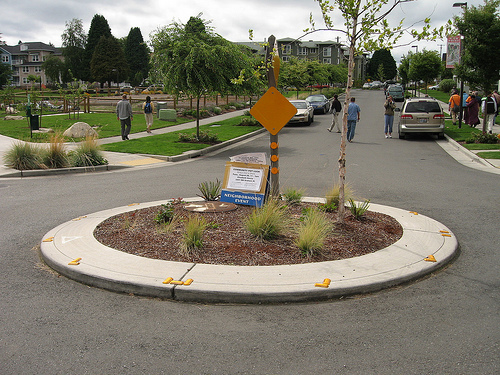 Many cities have the original “bone structure” – the street system that predated the car and that can be revived. Seaside Florida was based on drawings from 1928, and simply designed to recreate the sort of place people had known int heir childhood. The most unsustainable – Abu Dhabi – where there were no pedestrians or cyclists – but it will become the most sustainable – they have the will and the resources. 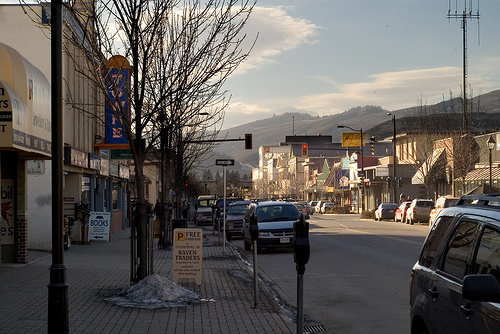 Vernon BC – “off the charts on aging in place”. It also shows the importance of scale and edges in bringing back people into cities. He used a graph that showed how pedestrain use increases and traffic declines based on the work of John Holtzclaw of the Sierra Club. As density increases from 3 to 4 units/acre to 20 units/acre, the number of car trips fall and the number of pedestrian and cycle trips increase. “There is a difference between densirty and form. It is important to grasp that. It is not about sidewalks and crossings. It’s about the buildings.” They have recently rediscovered the importance of smaller scale grocers in urban places. 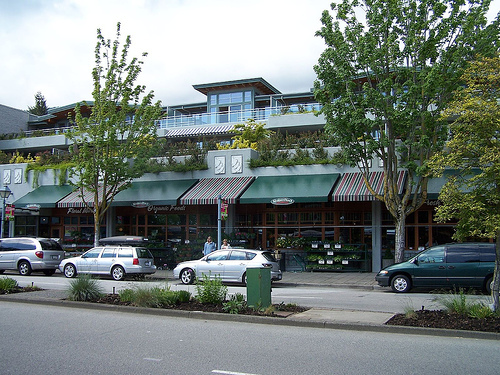 Dundarave shows how managing traffic better made a better, more vibrant place. La Hoya Blvd Birdrock San Diego – reducing 5 lanes to 2 got speeds down to 20mph and people got home sooner. That is because they replaced the traffic lights with roundabouts. All of the shops are doing better. Just by using pins and flexible string to determine routes, a six year old can do a better job of planning streets. The pins indicate where people are located and where they want to be. The string between them shows the shortest route. The flexibility of the string shows where these desire lines can be grouped showing where the pedestrian crossings and pathways need to be. You then just replace the string with pen lines. Land Use Planners set out what was needed to accommodate people and their activities which produced growth. This required the attention of transportation planners who expanded the system and encouraged further growth, which called for the land use planners to examine how to accommodate growth and so on. The only way of breaking the Cycle is to put the land use planners and transportation planners together with community planners. A In Seattle they require developers to build workforce housing – a percentage of each development must be affordable. Or they pay for extra density to the city which the uses those funds to buy land for affordable housing. Q In Vancouver we have the downtown East Side which is bisected by the 6 lane Hastings Street. There are a lot of low income income people and also problems of drugs and theft. Do you have experience of similar low income high risk areas? Q Are mandatory parking minimums part of the problem? Q second part – what is it going to take to get rid of minimum parking requirements? Is anybody here going to make that commitment? Q You spoke about the health improvements brought by these projects. For instance you said that Marine Drive in West Vancouver “lowered blood pressure”. Have you empirical evidence? 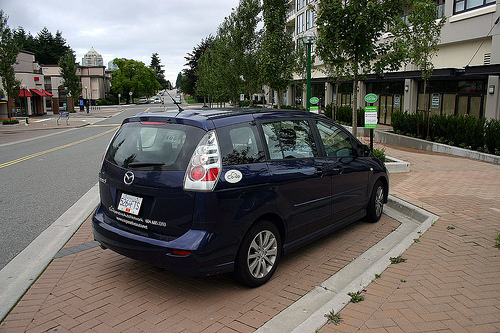 Q Returning to parking minimums – parts of Burnaby are walkable but they are surrounded by single family areas and that’s where the demand comes from for on street parking. Public streets are public. Having your own spot on the street in front of your house is not a right. We have to come up with right way to charge for parking. Look at the example of Cambridge where residents have to have parking passes. We also tried to get high school students paid for parking on streets which would then become a fund for street improvements. There should be a premium for priority on parking to increase turn over that then provides money to neighborhoods. 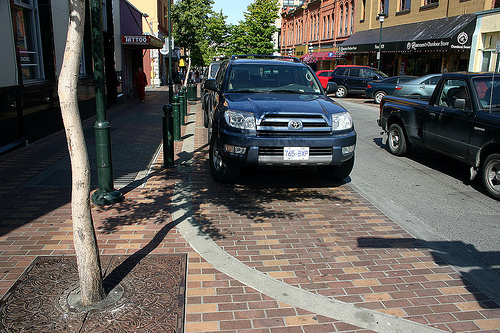 “No one has taken me up on that yet.” But we also need to ask “Are we really using the street properly”. Many suburban streets are too wide and could easily accommodate angle parking. Q How do we work with the “suburban mess”? Q I am wondering about how long these streets are? How far before energy peters out? A There is a need to change character of the street to reflect their neighborhoods: we tend to work in half mile sections. I went to an open house last night, run by the provincial Environmental Assessment Office. The project has been around for a while (the Green Party tried to get people to pay attention to it at the last election). The idea actually goes back much further and has already been rejected by Richmond twice, according to Harold Steves. The proponents are the consortium of airlines who make up the Vancouver Airport Fuel Facilities Corporation who have set up a website to promote the idea. The boards around the conference room, and the slides used by the presenter at the meeting, go into more detail than the brochure provided at the meeting. Probably the most informative document is the Project Description. On page 14 it describes the screening of fourteen different options from which this proposal emerged. I think it is fair to say that this gave rise to many of the concerns expressed at the meeting. Most people wanted to point out that there are better ways of protecting the environment than trying to clean it up after there has been an oil spill. The general preference I think is that we don’t put the sensitive habitats at risk needlessly. So the assumptions and methodology used to select this project from the other alternatives are critical. But that will not be the subject of this EA. Both provincial and federal representatives present spent the first 40 minutes of the meeting explaining how their EAs work. And then the proponent got to do his dog and pony show – with questions limited and restricted – and the only answer ever given was “put your concerns in writing and we will answer after the EA is finished”. I was surprised that the officials even decided to go for a public meeting format. An open house is usually preferred since opponents do not get a microphone, and cannot this let everyone else know what they are talking about. The meeting ran over time. The tactic of the officials and proponent to be be as dull as possible and bore people did not work. Most people stayed to get their word in. The project manager for the project spoke in a soporific monotone and avoided talking about any specific figures that might get quoted back at him. Yet is was the claims that are made to justify the project where he was weakest. For instance, it was repeatedly said – and is also in the project description – that the current system is “at capacity”. As a number of people pointed out that is not true: the pipeline pumps are only used intermittently, as there is not enough tank storage at the airport (it already being expanded). But any questions about the existing system were deflected by trotting out a lawyer who said that as the current system is owned by Trans Mountain and not VAFFC, they do not have to answer questions about it. The other obvious option – the use of the existing rail facility at Cherry Point refinery to load trains that could get to the existing rail sidings along River Road where a transfer to a much shorter pipe connection would need to be built – was dismissed out of hand. 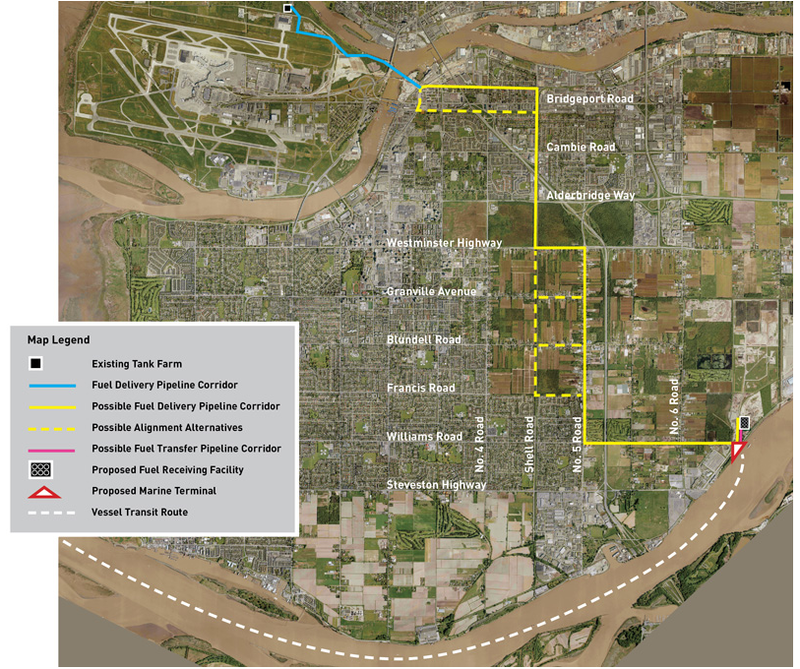 It is not even specifically addressed among the 14 options (only rail from Alberta was considered) but the project manager asserted it would be “too expensive”. There are, of course, no specific cost figures for any of the options, and when pinned on that point he waffled saying that the final cost of the preferred option could not be determined until its exact configuration was finalized (i.e. the route of the pipe within Richmond). VAFFC have already bought the property on the South Arm in expectation of proceeding. The other assumptions – about constant growth of traffic at YVR and improvements in aircraft fuel efficiency not being enough to reduce the need for the project – were also not defended. They just came from “other sources” (YVR and Transport Canada) and thus could not be questioned. Much was made of the fact that the project is not big enough to trigger a provincial EA but the proponent volunteered for one due to local concerns. Well, while technically true, a federal EA is triggered by the proposals use of navigable waterways and federal land (owned by the Port) so one was inevitable, so they might as well go for a combined EA. Fortunately for them, they do not put themselves in much hazard by so doing, since (despite the claims made by provincial officials) BC’s EA process is largely toothless. Some projects just give up, but very few are ever denied a certificate. It’s all about mitigation. The great strength of the opponents is that if fuel delivery were done some other way, mitigation might be much less. The problem is that the EA process does not have to test this assertion. It’s this project or nothing. No other option gets looked at. For the proponents, their major concern is that they have the ability to go to as many suppliers as possible. They do not want to be in thrall to any one supplier – or delivery system. To some extent, since they are the only customer for the existing pipe, they are using the proposal to put leverage on their suppliers. That concern is actually missing from the matrix used to select the final option but clearly weighs heaviest with the airlines. And it far outweighs all the other concerns. If we had a truly rigorous EA process each option would be evaluated properly – not just screened out by the proponent before the process actually starts. It is this use of a coarse, and unverifiable “sieve” that gives rise to most of the concerns. Involving the public late, and declining to go into details about how this project is justified, is simply inflammatory. Unfortunately for the proponent – who has been diligently working with governments and first nations – the public has to be consulted. And they can detect very easily when they are being fobbed off. My prediction is that as more people realize what their homes are going to be exposed to – and memories of that pipeline rupture in Burnaby are fresh in their minds – opposition is bound to grow. As those people realize that the options are not open to discussion, they will get angrier. Richmond is quite clear in its opposition to the project. The EA process will probably certify it, but I doubt that it can mollify those who feel that their interests have been protected. And, of course, for those concerned with the ecology of the Fraser delta, they have been disregarded for so many projects for so long, I am surprised that they still come out to such meetings. WASHINGTON, D.C. – The Center for Transit-Oriented Development (CTOD) has released a guide, “Transit-Oriented Tools for Metropolitan Planning Organizations” to aid Metropolitan Planning Organizations (MPOs) in taking a more proactive role in planning and promoting compact growth along transit corridors. Funded through a cooperative agreement between Reconnecting America and the Federal Transit Administration (FTA), the guide highlights best practices related to regulations, funding, information sharing and partnerships. With the release of the guide, CTOD will work with FTA, the American Public Transit Association (APTA ) and other transit industry partners to develop training modules for conferences and other events throughout 2010. Webinars and annotated Powerpoint presentations will be accessible via the internet. For further information and to see a copy of the guide, go to http://ctod.org/mpotod/. The text above is taken from a Press Release, obviously aimed at Americans. In Canada we do not have MPOs. In Greater Vancouver (or “Metro” if you go for neoligisms) there are two regional agencies that say they are working together to produce a better integration of transit and land use planning. Which would be encouraging if Metro had any planning powers it could use effectively to change the currently developing pattern of land use, or if Translink had any ability to determine its own future. But I know that readers of this blog like to keep abreast of developments in places where they try to do things better so there could well be useful information in the guide. So I thought I should pass this along. I wasn’t here. So I am not going to comment on what happened. But I think you should read John Calimente’s article in re:place Magazine. My thought is now that we have shown that it can be done – why does it have to be confined to a two week sports festival? The biggest reason of course is money. There was a lot more capacity on the system. The photo the magazine chose to go with the article is of the the line up of the special VANOC buses – which were not – as I understand it – available to the public, so I do not think they count towards the additional transit. But that’s a nitpick. The lane closures – and street closures – are also really important. Obviously there is more capacity than needed for single occupant vehicles, and when you start thinking about moving people, not cars, this is the sort of thing that is needed. Of course the same people who oppose any reduction in car movements are the same people leading the charge for the Olympics. They will now revert to type – and use the “well, that was different” argument. No, not really. Venues were spread about the city just as employment, schools and post secondary institutions are. There was an exodus (I was part of that) but that was compensated by the increase in visitors. Spread more through the day – but we could do a lot more about flexible work hours. But it seems to me that the reported satisfaction with the Olympics needs to be retained in the future. The legacy ought not to be just the medals and the odd sports facility. It should be to a more livable city – where getting around is easier and fun. All the time. Which means we need a lot more transit service. Of all kinds.